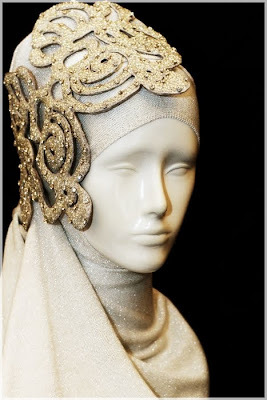 I found a complete gem of website the other day called Irna la Perle, an Indonesian company that features possibly the most beautiful (and modest) Muslim dresses I've ever seen. The prices are not shown (which can only mean one thing, unfortunately) but you can request information on the pieces using the form provided on the site. 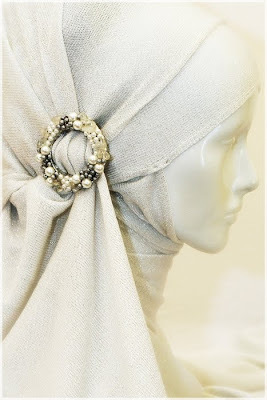 They call this next one a buckle as it's doesn't have any pins to ruin your scarves, lovely! 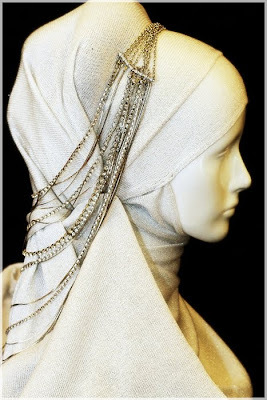 A bit too cyborg-ish for my liking..
Whoda thought putting a necklace onto a Hijab would work so well, eh? omg i wanna wear that someday when im getting married! haha its so beautiful! the dresses are lovely, but probbably not for someone with normal wages, they look lovely and expensive. yes they are very beautiful..and very expensive also.. 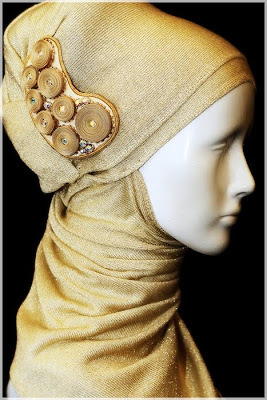 I love how they put accessories on the scaf! Wow!